We've talked about Dory Deli before, having previewed their menu before the official opening, but a preview on the consumer's end can't beat an in-depth look at the back of the house, standing in the kitchen, and inquiring into the mind of the executive chef. My own interest (and practice) in cooking has spilled over into a curiosity about what components make up the commercial side of this art form and what drives people to invest their time and efforts into the culinary world. Recently-turned Executive Chef Giovanny/Gio Bolivar of Dory Deli, previously Sous Chef, has seen great, rapid success in his career, and this new venture with the new, well-received restaurant is another step in that direction. 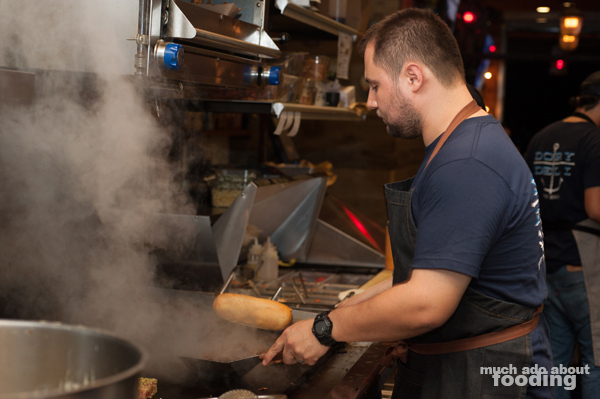 We met with him one evening to learn more about his history and to help make one of their most popular menu items - the Rocky Balboa. I started cooking pretty late in the game at 27 years old. I'm 31 now. At the time, I wasn't sure what I wanted to do but ended up helping a friend with a pop-up dinner and really liked it. I haven't been cooking for long but I'm very grateful for all of the help and chances I've had. Duck confit BUT I had no idea what I was doing. He said it was already done, and I just needed to pop it into the oven and watch it. On my own, at first, I tried to do short ribs and fancy stuff but found that simple foods are a lot better. 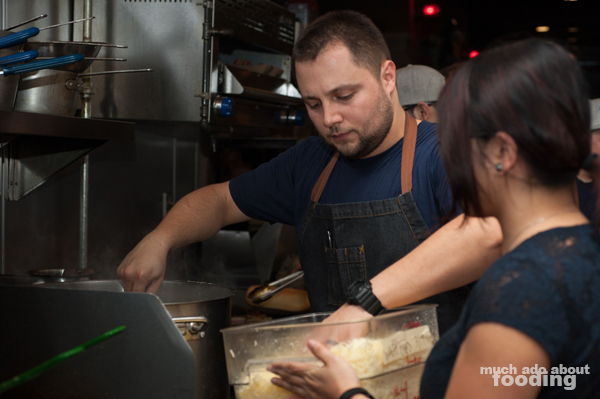 Once Gio got a whiff of cooking, he enrolled in Cypress College Culinary Academy to expand his knowledge which resulted in his first spot at Chapter One: The Modern Local in downtown Santa Ana. Afterward, the chef moved on to Hopscotch Tavern and El Amerikano in Fullerton and Nieuport 17 in Tustin before settling at Dory Deli. 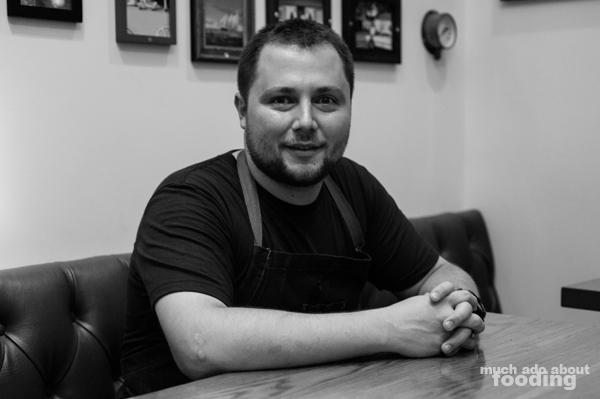 Having grown up in Garden Grove, the OC native has moved his way through several sections of the county, cooking up varying cuisines each time. We talked a bit about favorites as well - with an upbringing in Garden Grove and a Vietnamese stepfather, the chef unsurprisingly loves Vietnamese cuisine so we talked phở a bit and other cuisines that strike his fancy. 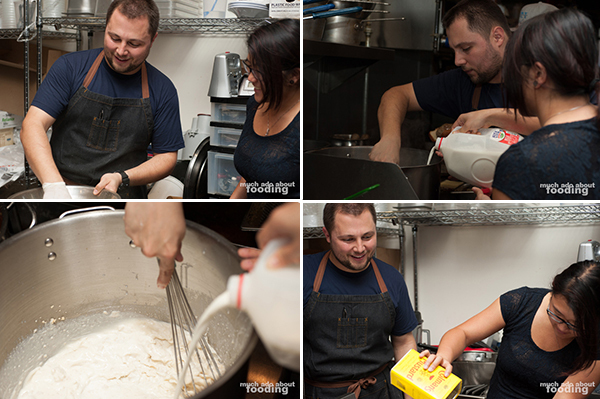 As with most chefs we've met, Chef Gio hardly cooks at home after his 13-hour, 5-days-a-week shifts. Eating out at other restaurants helps keep his mind whirring with ideas, particularly when many of his outings with his wife take place in Los Angeles. However, he did point out his admiration for the food of Chef Aaron at The North Left in Santa Ana when we spoke. Dory Deli's prime location in Newport Beach by the pier sits them near neighborhoods and heavy foot traffic. Lunch is a busy time, and the low price point allows for all walks of life to enjoy the restaurant's menu. In addition to the staple sandwiches and other menu items, there are rotating sides in the deli display with options such as tarragon and Greek chicken salads, black bean salsa, white bean hummus, and more. One main point of interest for customers is the fresh fish that comes in from the dory fleets around; these make up their Fish 'N Chips and fish sandwiches. Describe Dory Deli to me. It's not your average deli; it's more modern. 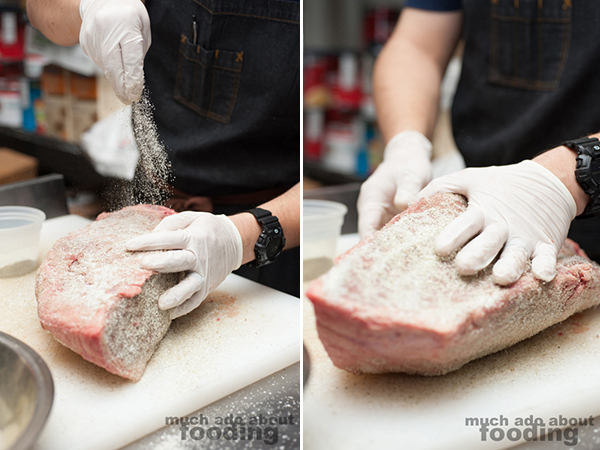 The same effort you'd put in a dish at a fine dining restaurant, we put into our sandwiches. Nothing is a second thought. 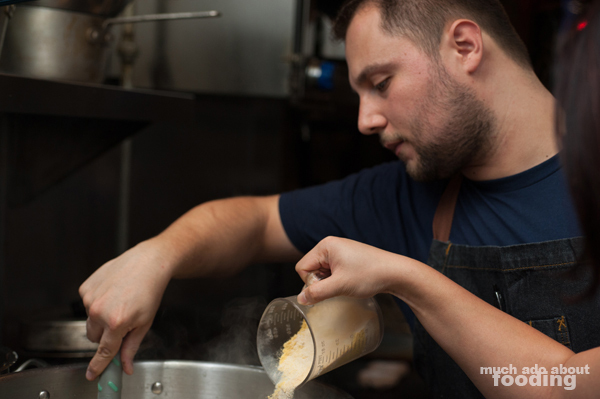 With the Cubano, we make our own mustard by soaking our seeds in IPA and other ingredients to set for 30 days. We make our own classic sofrito and six-hour braised pork. There is lot to prep for the sandwich but it's really good. Where's the story behind the name of the sandwich we're making? 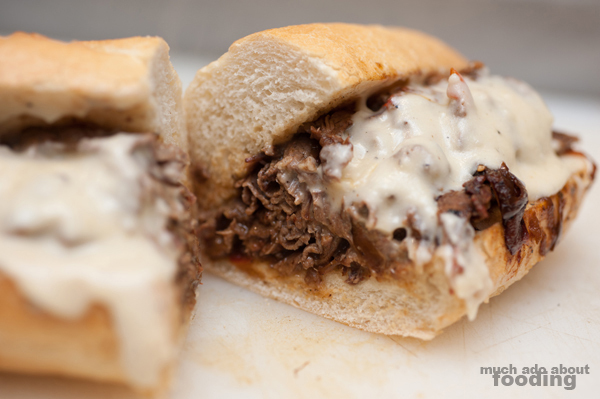 (Former Executive Chef) Chris is from Philly and wanted a cheesesteak. I wanted to take a stab at it, and the owner [Mario] wanted fun names for everything. This is a knockout so we called it the Rocky Balboa. So with Chef Gio's background, why were we making a sandwich? 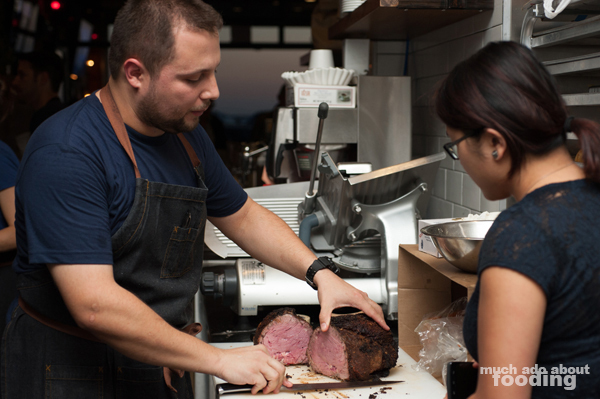 The process per ingredient is still taken with great care despite the casual nature of a sandwich. For building the Rocky Balboa, we began by creating a herb salt composed of dried basil, dried sage, dried marjoram, dried thyme, garlic powder, and salt. 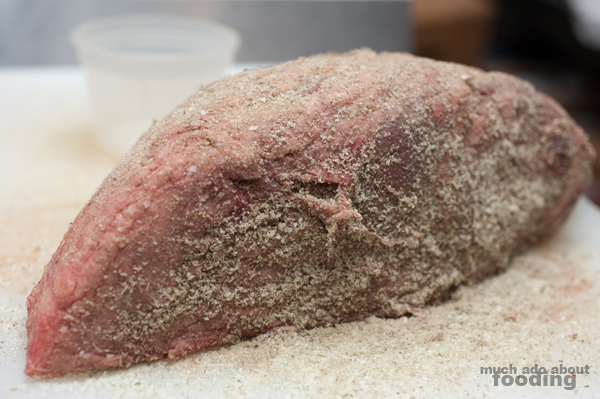 The aromatic seasoning is then thoroughly coated onto a sizable piece of beef top round and cured overnight as the moisture is drawn out on top to form a desirable crust. 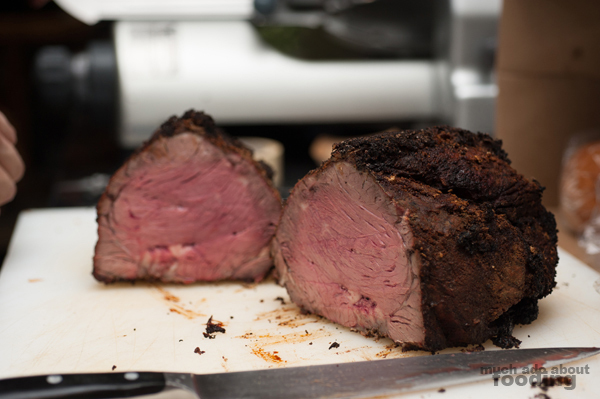 This hunk of beef would then, the next day, be roasted for an hour at 500°F and another half hour at 350°F for a perfect slab to be sliced afterward. So while we waited for the cure, cheese whiz came next. A pound of butter and four cups of flour started our base. Next came a combination of mustard power, onion powder, garlic powder, salt, and pepper while another container held a motley crew of Swiss, Provolone, Cheddar, whatever cheese scraps were available. This component of the Rocky Balboa took Chef Gio three runs in the initial development phase before the final recipe was developed. Despite knowing the process, he still would taste-test the whiz throughout the process of making it. To our surprise, he did admit that he was lactose intolerant so perfection in a short amount of time is necessary; too many taste tests are not desirable! What else goes into the sandwich? We are constantly cutting onions and peppers for this. Half of the grill is just that. It is the most popular item besides the Lifeguard Club sandwich. We also have found a way to toast buns perfectly without breaking. After that, it's done. 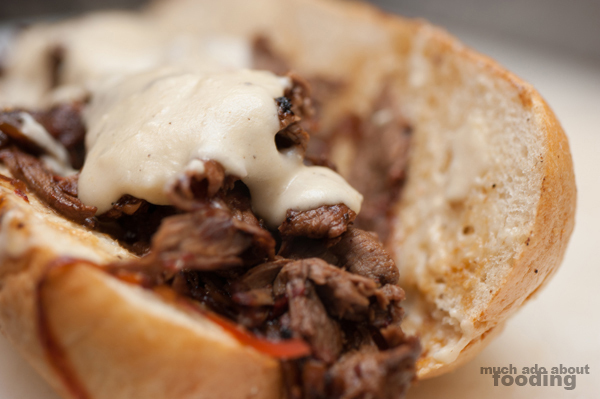 Toasted bread, roasted beef, onions and peppers, and whiz to finish. What dish is the most fun to make? Clam chowder because I'm not a fan BUT I want to have the best around. That one was a struggle. It took 15-20 recipes until I finally liked it. I want to be able to make anything and everything, be versatile. If I don't know it, I want to try it even if it's something I don't like. You'll always find something you like if you prepare it a different way. I like sushi but I don't like cooked fish. Yet, sometimes you'll find that cooked fish that's delicious. Aaron at the North Left is great with that. At home, I make a great white bean ragout! In such a small kitchen, it is a wonder to see how many people are expertly dancing around each other back there. 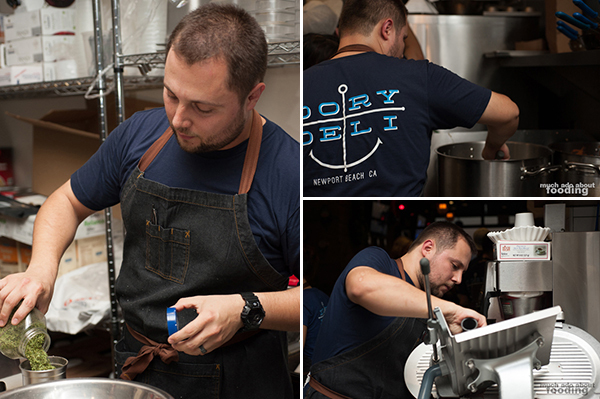 Dory Deli is built on the success of their full menu's collaborative effort by the chefs and their desire to ensure that all cooks can consistently cook the dishes with or without the Executive Chef present. What has been the biggest challenge for you at Dory Deli? This is my first Executive Chef position. I've never had to oversee everything but I am eager to lead and help others grow. I'm thankful for how supportive my wife has been and the crew. We're a team here, and I look forward to growing in this position with everyone. 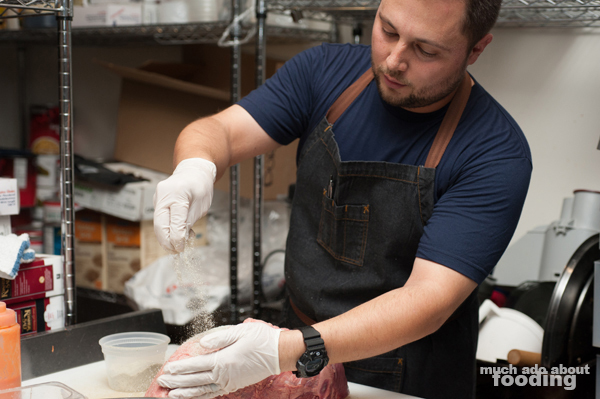 Overall, we are excited to watch Dory Deli and Chef Gio's career grow from this point forward. Taking a passion for cooking and perfection to build out products to be proud of seems to be the chef's goal while bringing up others with him. If you are interested in checking out the restaurant, make sure to dig into the Rocky Balboa and one of my favorites there, the Buffalo Mary!